As a child, Cecilia Mzumara grew up in a family filled with vibrant faith and rich in apostolic and social commitments. She met people who had a passionate desire to help others in their human and spiritual growth. Today, Cecilia draws from that valuable experience. Therein, she discovers what has nourished and still nourishes her religious and missionary vocation. At eight years of age, Cecilia already observed with great attention how her mother and the Missionary Sisters of the lmmaculate Conception worked together with extraordinary harmony and with untiring devotion. The Sisters and her mother were united in their thirst for God and in their joy of helping others to grow humanly and spiritually. She also noted how these missionaries worked with the catechists in her school and got deeply involved in the integral formation of women. Sister Cecilia still treasures the memory of her long conversations with her mother. I loved to receive her confidences. She would tell me about her admiration for Délia Tétreault, the foundress of the Missionary Sisters of the Immaculate Conception. I also listened with great delight to her stories about my grandfather lgnasio. She would tell me of his determination to become a Catholic. He had patiently studied the catechism and prayed unceasingly that he might be baptized in 1935. Having become a teacher in a small village school, and then the first catechist of the mission of Katete, he worked for more than 30 years with untiring devotion. Generously facing situations all kinds, he was on unrelenting witness to his faith, bringing the Gospel to others. Without a catechist, these Christian communities could not have survived. Mama never forgot the impressive religious ceremony at which my grandfather was awarded the golden Bene Merenti medal from Pope John XXIII, in gratitude for his services as a catechist Besides this, he received a Papal blessing for himself and his whole family. What a festive occasion for the whole community of Katete! After her secondary school and a special training in education, Cecilia embarked on her role as a teacher. She enjoyed this work and devoted herself to it unsparingly. In this period of her life, the Lord's call to religious life became more and more direct and continuous. She questioned herself and gave it much thought and prayer. What choice do I make? Marriage or religious life? What does God want for me? She greatly admired her aunt Ernestina, a member of the Sisters of the Holy Rosary, a young typically African congregation, well rooted in the country and working with great competence in various ministries. 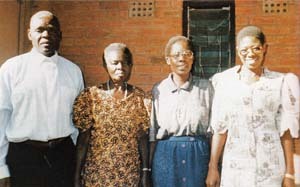 She knew other religious institutes as well, for within a few years, the Church of Malawi had grown rapidly and religious life was now quite flourishing. However, it was with the Missionary Sisters of the lmmaculate Conception that she decided to verify whether God was really calling her to religious life. During a retreat at the Sisters' convent, a Gospel passage struck a particular chord and resounded strongly in her: Jesus saw the two disciples following Him and He asked:'What do you want?' They said, Rabbi, where are you staying? "Come,' He said, 'and you will see.' (Jn 7:38). A light began to shine in Cecilia's heart. She was moved by a keen desire to meet Christ and a profound eagerness to reach out to others. With all her heart, she welcomed the vocation to which God was calling her: she would be a missionary. I was now ready to reveal my desire to join the Missionary Sisters of the lmmaculate Conception. 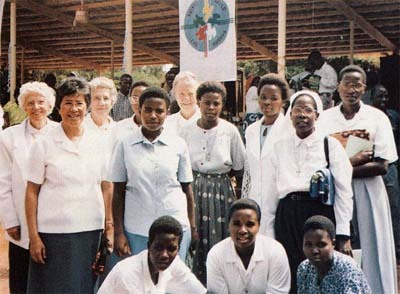 In Africa, young women are not pressured to enter the convent. Women represent the promise of numerous children and their duty consist in giving life to perpetuate the lineage of the ancestors. In this context, to give up motherhood implies an experience of bereavement. But Cecilia held on to the deep conviction that a life dedicated to God is a fruitful life. Having become a religious missionary, she was sent to Zambia on a pastoral internship and then was recalled to Malawi where she was asked to take charge of the formation of young African women interested in joining our Institute. Ever attentive to God's call, Cecilia continued her inner journey. She keeps vibrant in her heart the ardent desire to bring to others the Gospel message of Jesus Christ who longs to meet us and to give Himself. In her beats the heart of Africa.